SmartPlate Reviews - Is it a Scam or Legit? SmartPlate features 3 load sensors and digital cameras that automatically weigh and analyze your food, while the app crunches calorie and micronutrient data. Whether you’re looking to lose a few pounds or you’re training for your 10th Ironman triathlon, calories are a big part of your life. And not just the number of calories you’re consuming, either; but also the type of calories, in the form of macronutrients. Until recently though, all of these factors had to be manually tracked and recorded. With the release of SmartPlate, however, the company claims this is a thing of the past. All you have to do is add your food to SmartPlate like normal, and it will instantly and effortlessly analyze and track everything you eat. How? Built into SmartPlate are 3 load sensors that capture the exact weight of your food, which helps calculate the amount you’re eating, as well as how fast you’re eating it. SmartPlate also features 3 digital mini-cameras (similar to what you’d find in a smartphone) that use advanced image recognition to identify everything sitting on its surface. SmartPlate then takes all the data gathered by these sensors and cameras and sends it to the USDA’s database of 8,000+ common foods—combined with the company’s own database of 300,000+ SKUs and 100,000+ restaurant meals—in just a few seconds. What’s returned isn’t just the identity of your food, but also its calorie count and nutrient composition. Finally, SmartPlate takes your behavior and makes subtle recommendations that can help you lose weight, improve physical performance, manage conditions related to poor nutrition or eating habits—whatever your needs may be. Sure, SmartPlate seems pretty cool, but will it work as well as the company makes it seem? And even if it does, just how useful will you find the data SmartPlate provides? Is it ultimately worth the money? Let’s dive in by taking a closer look at how SmartPlate works. From an aesthetics perspective, SmartPlate looks like something from a 1960s science fiction film. It’s made from a non-stick, BPA free, and heat resistant plastic that’s microwave, refrigerator, and dishwasher safe. If you don’t feel like tossing a $150 plate (more about this soon) in the dishwasher, SmartPlate can also be rinsed and air dried directly on its included water resistant charger. SmartPlate is 10” in diameter and each of its three sections were specifically designed to prevent "portion distortion," which can have a huge impact on your waistline. Underneath each section is a load sensor, which can measure up to 1,500 grams, or 3 pounds. Open the SmartPlate iOS or Android app. The device automatically connects to your smartphone or tablet using WiFi and Bluetooth, so you just need to select the “Snap It” option in order to take a picture of your food. If you’re happy with the picture, click the check mark in the lower right-hand corner to submit it. After a few seconds, the SmartPlate app will analyze your food and break down the information (calories, macronutrient content, etc.) in an easy-to-read format, all in as little as 1 second. Once SmartPlate’s analysis is complete, you can choose to add the information to your journal. This will even integrate with your wearable device, including MyFitnessPal & FitBit. At the core of this process are SmartPlate’s proprietary algorithms (which the company affectionately calls a “she”) that learn the more they’re used and are utilized in the plate as well as the iOS and Android apps. This way, you’ll still be able to identify foods and track nutrient information, even without your SmartPlate nearby. Although your SmartPlate might already be able to identify whole foods (like apples) with up to 99.9% accuracy, it might take some learning before it can accurately identify, say, the difference between a salad with ranch dressing and one with vinaigrette. If the algorithms aren’t able to identify a food, they’ll take a educated guess and give you several different options to choose from. This is another big way that SmartPlate will “learn” different foods and improve overall accuracy. After a food is identified, all the key macronutrients (e.g. protein, carbs, sugar, etc.) will be displayed on your screen. The app will even let you know if you’ve exceeded your macronutrient intake for day, so you can better achieve your goals. Now, the more important question might be: Once you have all of this information, what’s it good for? How Can SmartPlate’s Data be Used? According to the company, SmartPlate’s data can be customized and personalized around you. Need to maintain a certain diet for health reasons (such as diabetes or hypertension)? Or, are you looking meet a specific dietary goal, such as losing 10 pounds? Whether you’re an athlete, a health generalist, someone who needs to manage their health condition, or someone who needs to lose or maintain weight, SmartPlate claims to offer a helpful solution. How? You’ll be able to carefully track every meal, so you’ll know exactly how many (and what types of) calories you’re consuming. SmartPlate’s Portion Patrol will instantly warn you if you’ve been over-served, and the access to 200+ recipes and personalized meal plans can make sure you’re eating a healthy, balanced diet. Whew! That certainly seems like a whole lot of technology packed into a 10” plate! Considering this, how much will you pay for SmartPlate? How Much Does SmartPlate Cost? 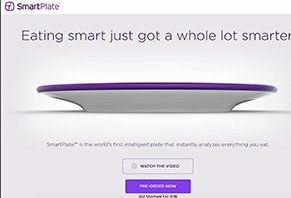 SmartPlate is currently available for pre-order, with an estimated Fall 2016 delivery date, for $119 (retail will eventually be $149). For this price, you’ll be able to choose between purple, black, or white colors. Your order will also come with a microwavable lid. SmartPlate also comes with a 1 year limited warranty against defects in materials and workmanship under normal use. In order to process a refund or warranty claim, you’ll need to contact customer service to obtain an RMA at 844-438-3485 or support@fitly.com. Are customers finding their SmartPlates useful? What’s Everyone Saying About SmartPlate? SmartPlate originally got its start through a Kickstarter campaign, where the fledgling company brought in more than $110,000 to begin development and production. SmartPlate received even more public face time after being featured on season 7, episode 17 of Shark Tank. What happened? Ultimately, none of the Sharks invested, as they felt the technology wasn’t quite there yet. Several also questioned its price tag, as well as the fledgling company’s use of third-party firms to design the product. Outside of this, SmartPlate has received quite a bit of media attention, having been featured in popular outlets like Forbes, Mashable, and many others. Since SmartPlate isn’t set to ship until the Fall, however, there weren’t any hands-on reviews at the time of our research. In other words, the author felt that even if you chose to count calories for one reason or another, SmartPlate might not be as accurate as the manufacturer claims (at least based on its current algorithms). SmartPlate is manufactured by Fitly based out of Philadelphia, PA. According to Founder and CEO Anthony Ortiz, he was especially passionate about bringing something like this to market after watching his father go through triple bypass heart surgery—which he claims could have been avoided through proper diet and exercise. SmartPlate’s website claimed that “Fitly is a two-time Digital Health Award winner, University City Science Center-backed and DreamIt Health alumni, with a proven track record for vetted technological innovation.” However, other than a similarly named app (now called Fit Simply), we weren’t able to find Fitly’s website or verify any of these claims. Now, let’s answer the most important question: Should you pre-order SmartPlate? Is SmartPlate Worth Your Money? The value provided by any purchase is directly related to your needs. In other words, if your primary goal is to lose weight—because it relies so heavily on calorie counting, which is a flawed system itself—SmartPlate might not be your first option. In fact, if you’re simply looking to tabulate calories, you can do so through dozens of different apps that cost a whole lot less, although you’ll often be responsible for manually looking up the calorie content for each food you eat. However, if you’re looking to closely monitor your calorie consumption (as part of a fitness regimen) or your macronutrient intake (for diabetics or those with hypertension, for example), then the ease of use and tracking provided by SmartPlate might be worth the $119 (or $150 after the increase) price tag. Did you order SmartPlate? Once you had it in your hands, did it perform as advertised? Tell us all about your experience by writing a review below! I have been waiting for almost 1 and a half years for my SmartPlate. What concerns me most is that I keep getting the runaround from Fitly (the manufacturer), saying that they will be shipping by such and such a time. I have been told three different times that they would deliver and still nothing. They're also advertising a new product and just made over $20,000 on their latest IndigeGoGo! How is this possible?! Has anyone actually received their SmartPlate? I'm to the point where I am asking for my money back, and if I hear nothing, then I will look into legal action. Do yourself a favor! Do NOT order the Smart Plate. Yes, I'm still waiting for my plate as well. I ordered the plate to try to watch my calories. I haven't received it yet, and I ordered it in December of 2015. It's now February of 2017. I tried contacting the company about twenty times through email, and my emails are not going through. There is no phone number on the website. I contacted the Better Business Bureau and submitted a claim, but I didn't receive any responses from anyone. I might contact New Jersey State Attorney. I paid $100 for this plate, and didn't receive it! I also ordered it back in December of 2015 and I haven't received my plate yet. They also keep giving me the runaround on when it's going to be sent out. This is ridiculous. I emailed them my order number and told them I want my money back. We'll see! Total rip-off. I ordered three years ago and still have "zippo" They have "technical" problems. Do NOT waste your money. Write a Review for SmartPlate!